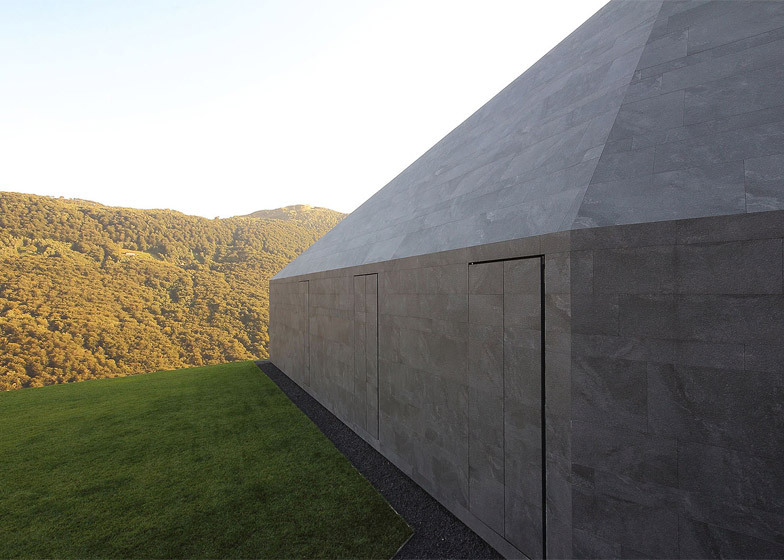 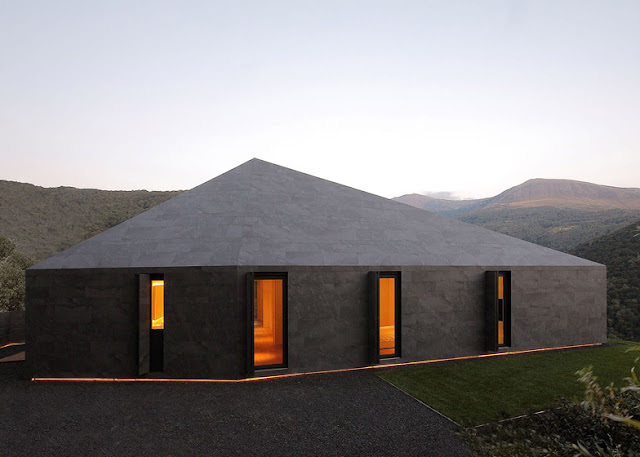 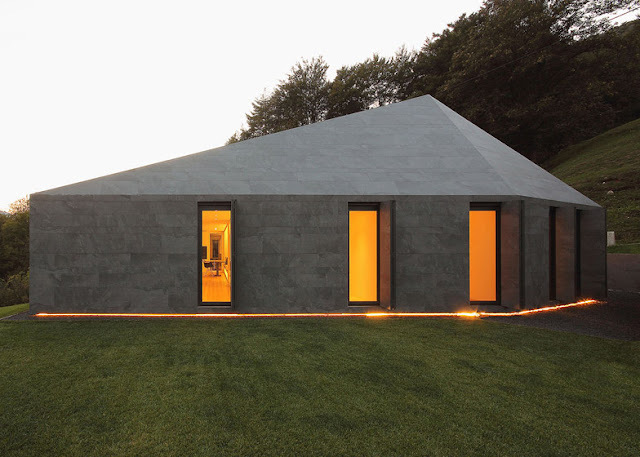 Milan based JM architecture designed a minimalist monolithic house in the Swiss Alps that looks "like a stone in the landscape”, with its angular shape covered in mottled grey tiles that match the tones of the mountainous surrounding landscape. 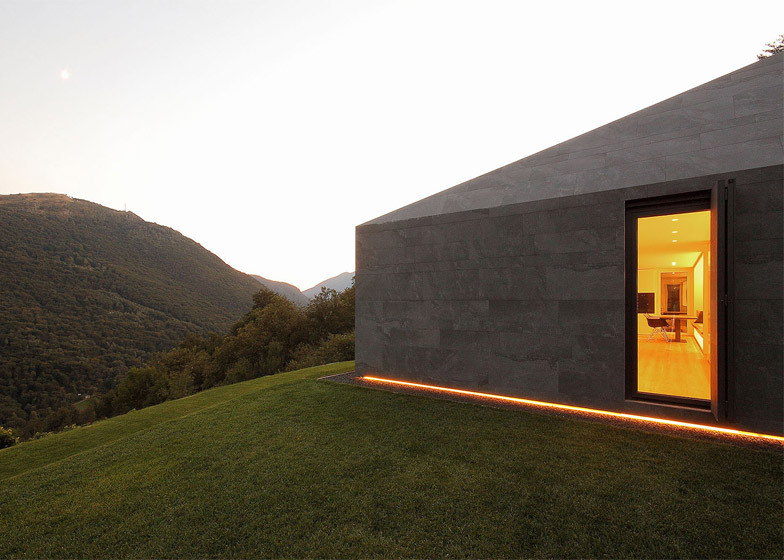 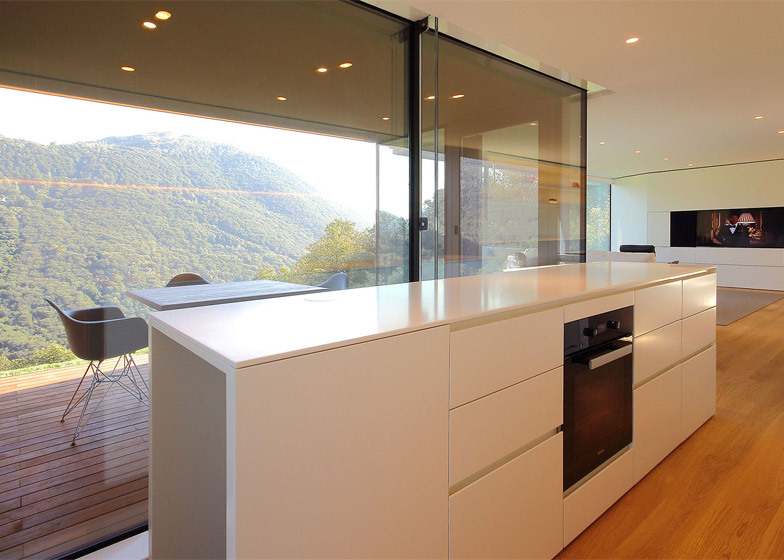 “The Montebar Villa is a prefabricated wood house lying on a panoramic spot facing the Swiss alps, in a privileged position with sun light during the four seasons. 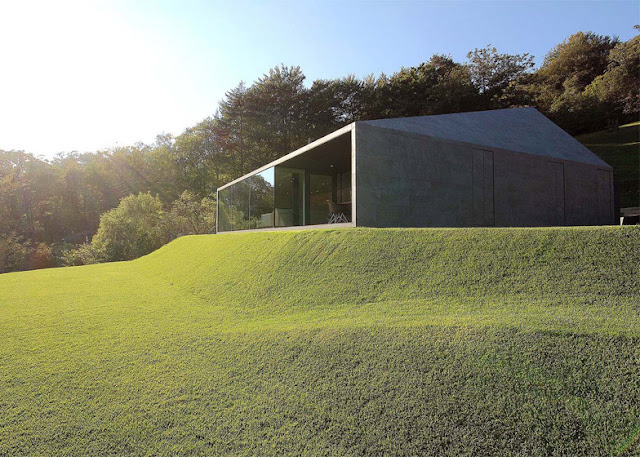 A magical place where the silence is alternated with the gentle chimes of cows at pasture in the distance, where the calm breezes coax tree branches and grasses to release and carry a sweet and fragrant air. 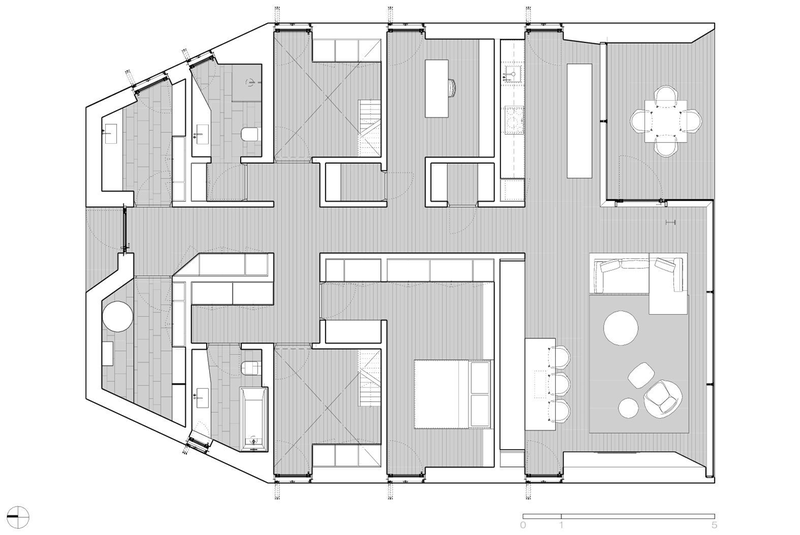 The project was created around the local building code, which imposes each house to have a dark gray pitched roof for a better integration with the environment. 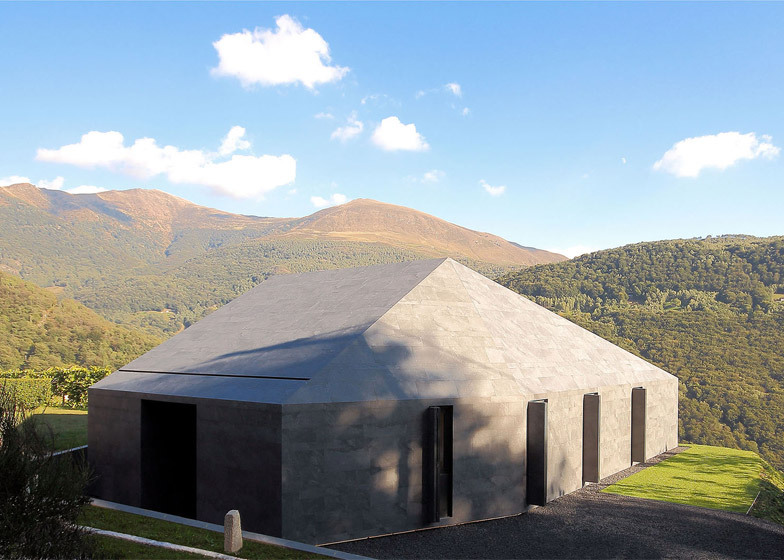 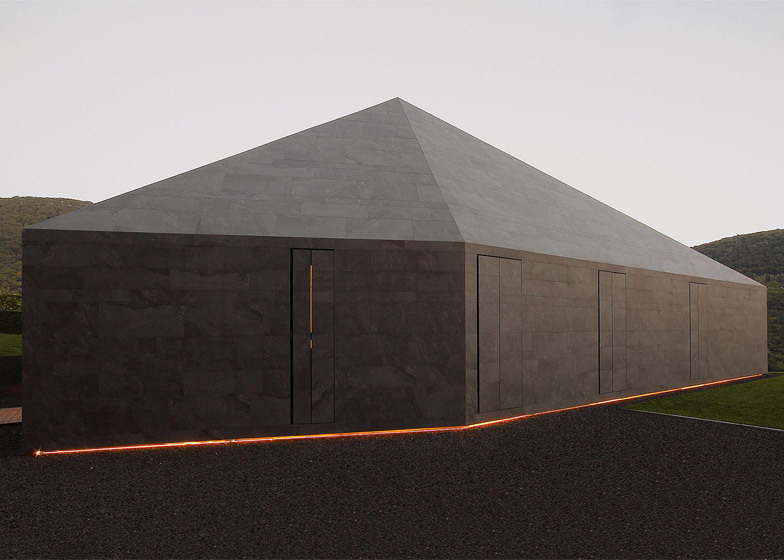 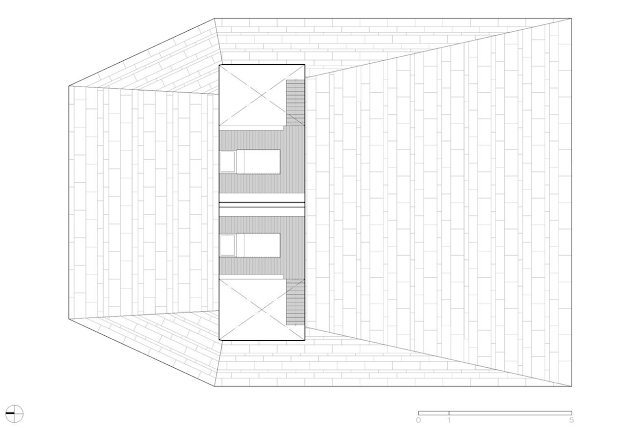 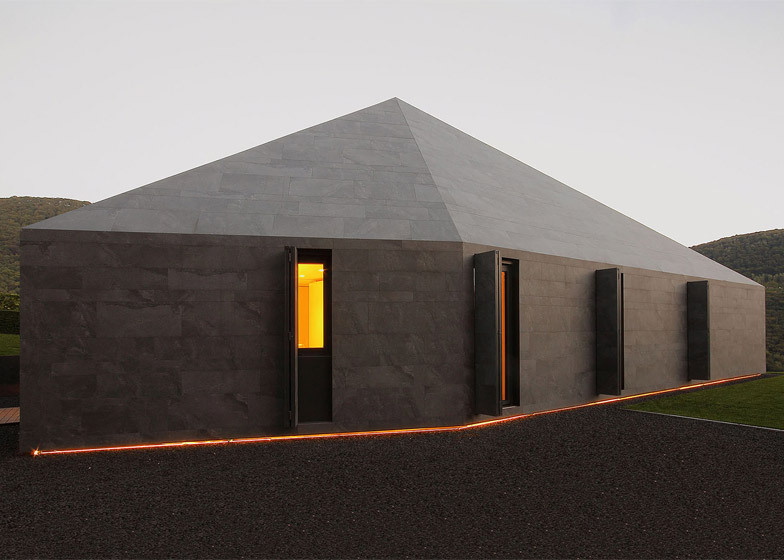 Starting from this constraint, the idea developed into an homogeneous solution using the same material for both the roof and façades, in order to provide the building with a monolithic aspect, like a stone in the landscape. The only exception is the South elevation, facing the valley, which grants a spectacular 180 degree view through a curtain-wall that encloses the living area and folds inside creating a loggia to be used in the warmer months. 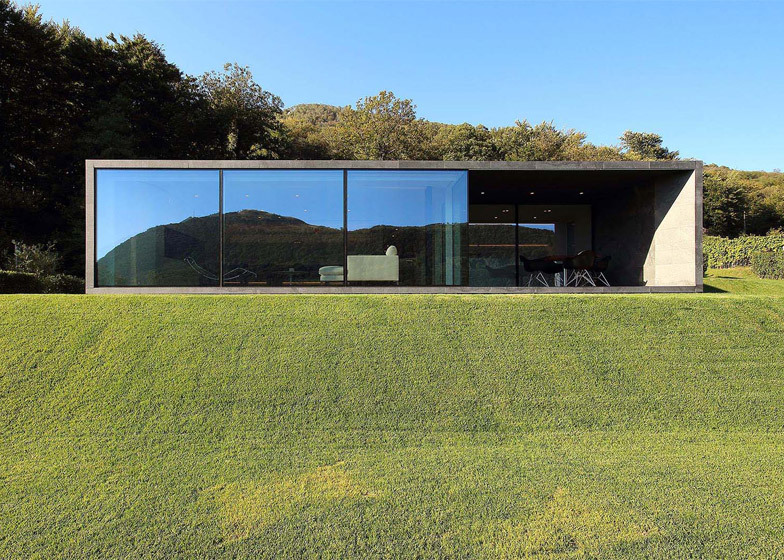 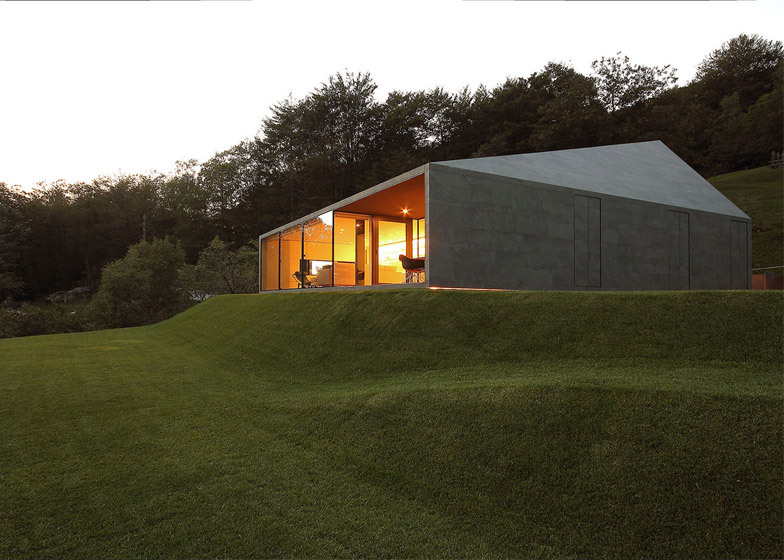 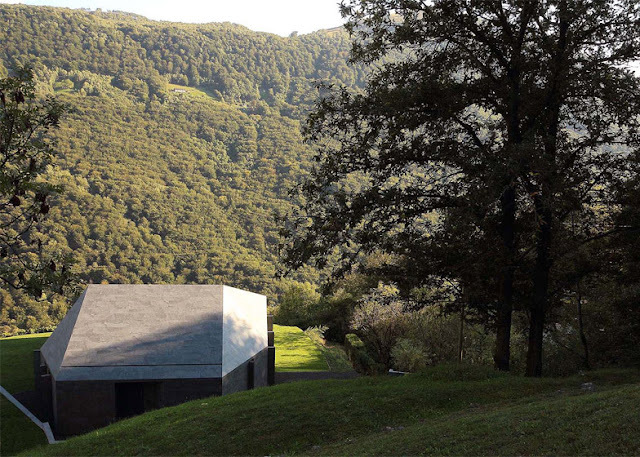 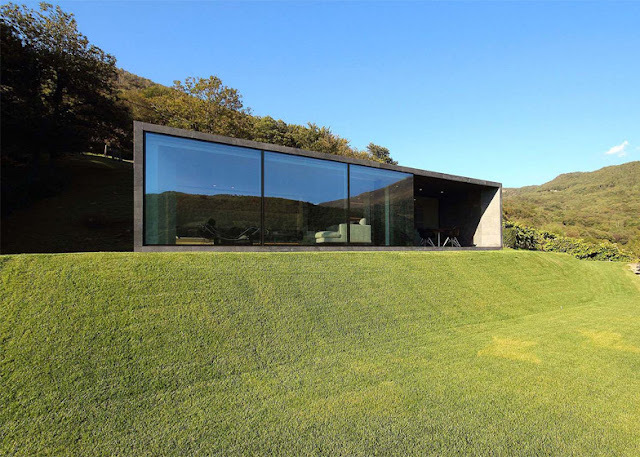 The house is placed at the edge of a slope with vineyards just a few meters below and around. It’s constructed with prefabricated and thermally insulated wood elements, ideal for this type of climate, and the entire structure has been assembled in a few days. The same stratigraphy has been designed for both the roof and the perimeter walls, with 22 centimeters of thermal insulation and a double layer of ventilation, in order to achieve high standards of energy performances. 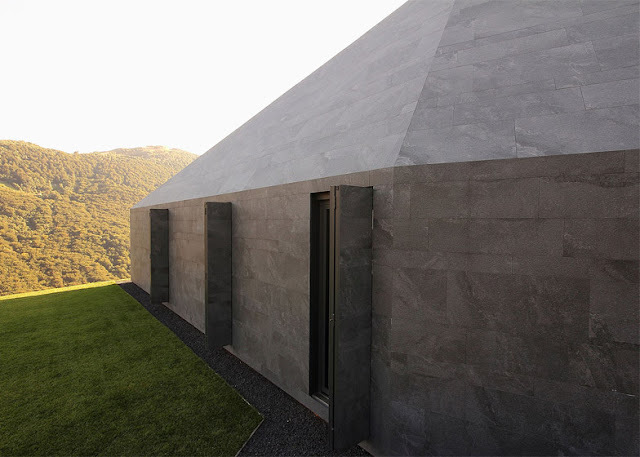 The final cladding material uniforming the shell is a ventilated façade with porcelain stoneware tiles and an invisible fastening system. 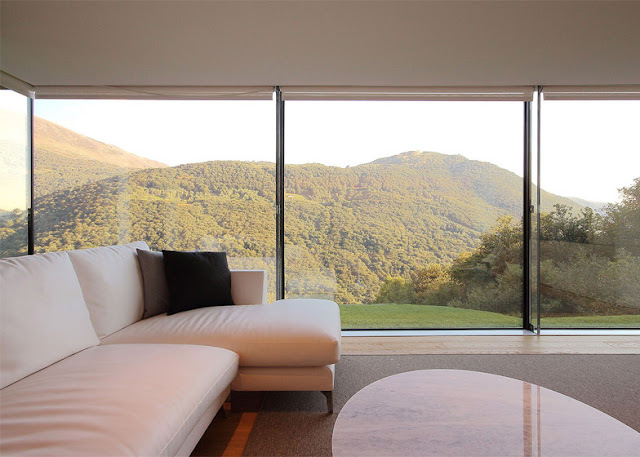 To complete the energy efficiency of the building, the glass façade of the living area has a curtain wall with thermally broken aluminum horizontal profiles and vertical glass fins, and with insulated selective and low-e glass. 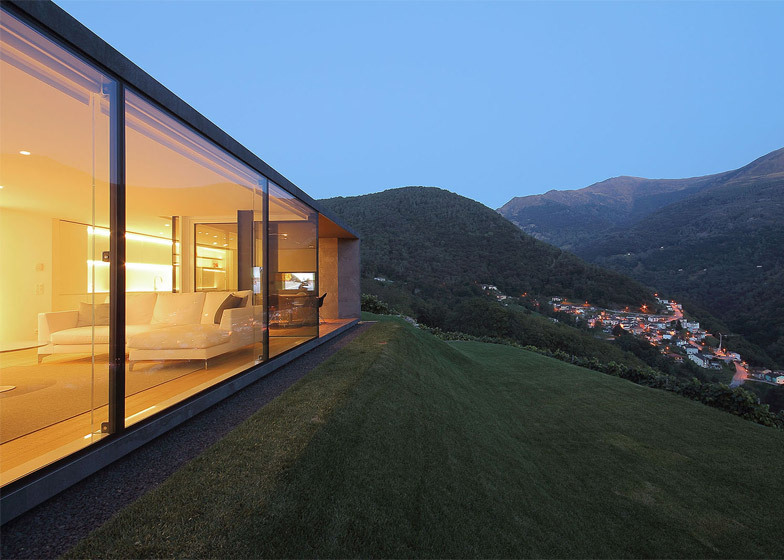 The rest of the windows have a thermally broken aluminum profile with triple insulated glazing. 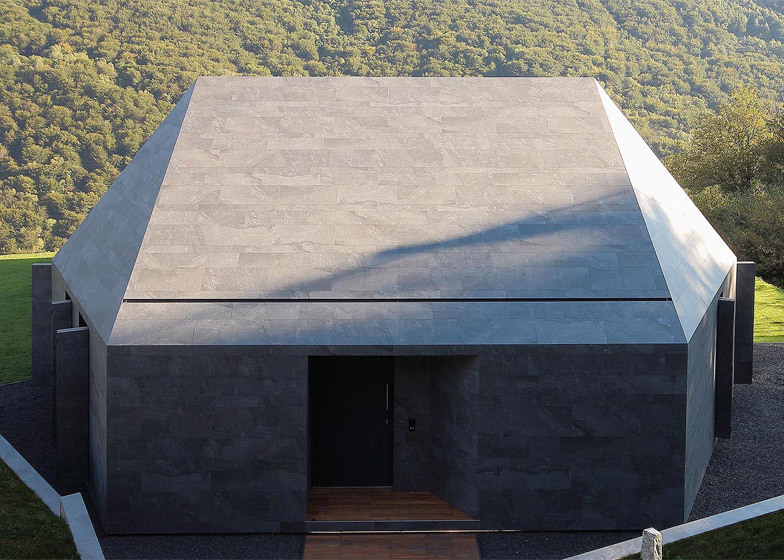 A big part of the design phase was spent investigating several options for the exterior cladding, in order to achieve flush surfaces and obtain a pure and simple form. 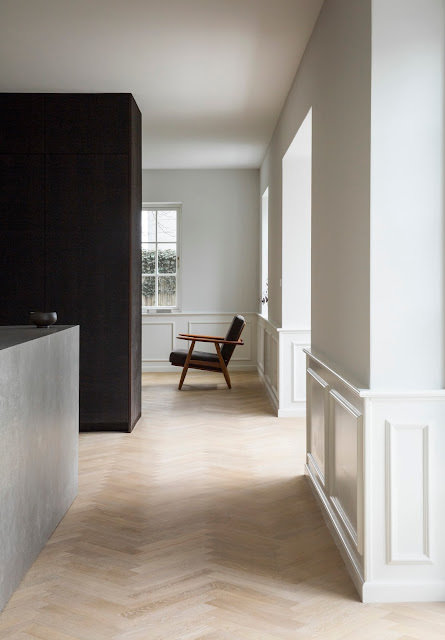 Every face of the shell has been designed tile by tile, with a dynamic pattern composed with three different formats, and many tiles have mitered edges. 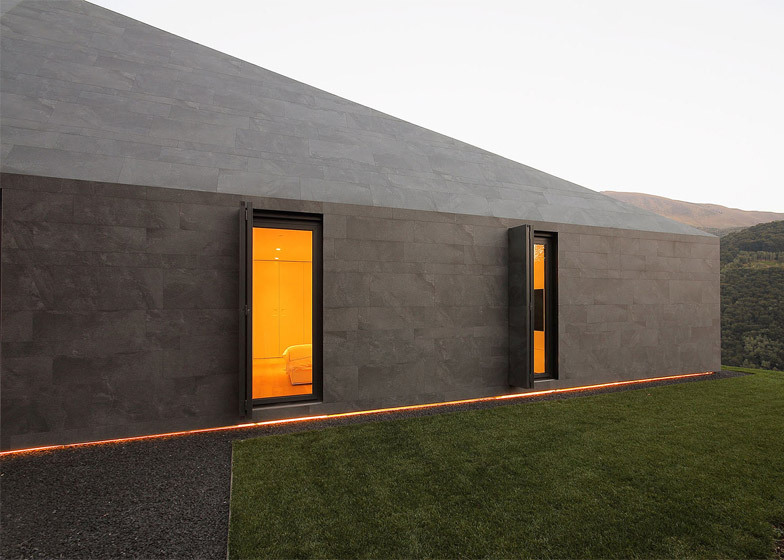 The same porcelain stoneware material has been applied to the custom designed folding shutters, to match and align with the façade pattern when they are closed. The six-sided roof is offset toward the mountain and it’s calibrated to have the largest side with the same mountain inclination, for a better integration with the landscape.